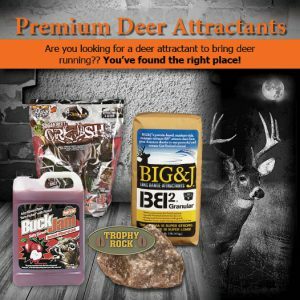 Are you looking for a deer attractant to bring deer running? You’ve found the right place! Farmers Coop offers a large selection of deer attractants. We have the best brands proven to attract deer. Trophy Rock Lick – With 65 natural macro and micro trace minerals, Trophy Rock improves antler growth and over-all herd health. It also attracts and holds deer on your hunting property. Buck Jam – This juicy, salty-sweet mineral lick is full of irresistible flavor. Intense aromas attract deer instantly. Comes in a one-gallon jug. Molasses from Evolved Habitats – Natural energy-boosting molasses is a great source of minerals and nutrients for deer. Simply pour over hay, feed or other minerals. Stop by your local Farmers Coop for all your hunting supplies. We’ve got feeds, supplies, attractants and of course, deer corn! Selection may vary by store. This entry was posted on Tuesday, September 19th, 2017 at 2:36 pm	and is filed under News & Updates, Wildlife, Deer. You can follow any responses to this entry through the RSS 2.0 feed. Both comments and pings are currently closed.